BioPredict Inc. is a US biotechnology company focused on the development and application of novel drug discovery computational technologies. These capabilities are applied in internal research programs as well as augmenting the drug discovery programs of our customers. Today’s Pharmaceutical and Biotechnology companies face ever increasing pressure to bring drugs to market faster. The imperative is the accelerated production of higher quality clinical candidates, less vulnerable to expensive late stage failure. Addressing these challenges requires high-throughput approaches to accelerate the process of hit identification, hits to leads, and lead optimization, the latter through iterative cycles of design, synthesis and testing. Modern drug discovery methods are data intensive and their use demands effective means to turn this sea of data into knowledge capable of guiding the next steps in drug discovery. 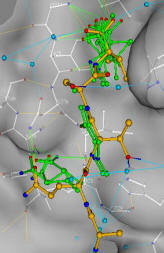 To develop mathematical and computational methods, and software tools to facilitate the drug discovery process. To actively apply computational platform technologies and methods to internal drug discovery projects. To augment the success of client companies drug discovery programs.